A basic primer on Planning and Services for Children and Adults with I/DD. 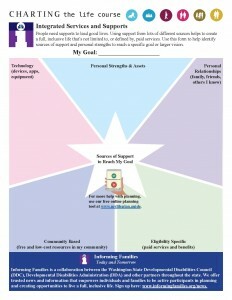 A Star Form to help identify supports to reach goals of any kind. Process to Apply for a Determination of DDA Eligibility in Washington. Get Organized for Life by identifying and filing key documents that will be needed to apply for programs through a person’s life. Description of Washington State’s DDA’s Wavier Programs and Community First Choice (CFC). Download a PDF version of the four-page pamphlet here.